It’s a Janelle Monáe World! 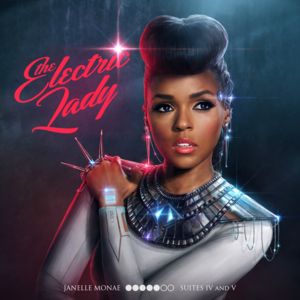 Janelle is a 29 yr old R&B and soul singer,songwriter, composer and producer who is also an arch android from metropolis. Her music is centered around this alternate planet she created and with every album released we get more background story about her characters in a fascinating way. Like I mentioned she brings something fresh to the music scene…read on! It was a brilliant mesh of retro with futuristic backtracks and it will get you searching for your dancing shoes and bobbing your head. But not only that, if you listen to the lyrics you hear a message of not letting failures or success get to your head. All her songs hold important messages. Janelle sings, dances and raps like nobody’s business! She was brilliant, there’s just no other way to say it. She embodies the spirit of Michael Jackson, Jemi Hendrix and Erykah Badu. Now do you get the feeling. She also represents ‘Other’ which means someone who is distinct in character and personality. Someone who does not reform to a standard which shows flawlessly through the way she celebrates her identity. We adore her on this planet! Janelle’s owned label Wondaland which has an eccentric mix of unique artists who fit into their own personal genre. Wondaland entered a joint venture with L.A Reid’s record company making Janelle THE BOSS of her own world. She was likened to P.Diddy and Jay Z, that outta inform you of how great she is. I have a playlist of some of my favourite songs of Miss Monae’s below. I hope you enjoy it and let me know if you are a fan or if you’ve joined her fanbase which include Michelle and Barack Obama!